This revolutionary machine is the first of its kind. 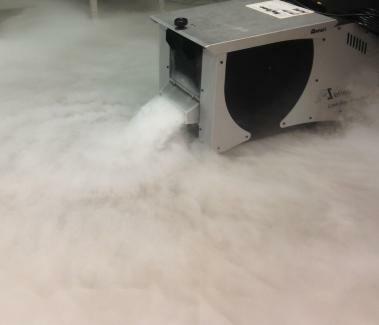 It produces the ever popular, low lying "heavy" smoke of a dry ice machine, without the inconvenience of dry ice or the potential health hazards caused by dry ices heavily CO2 laden smoke. 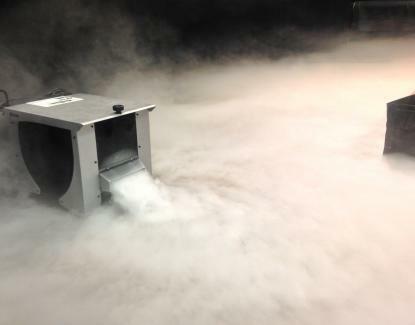 Place up to 10 kg of ice into the ice chamber to cool the smoke produced by the 1000W smoke machine contained in this unit. Then watch the floor disappear in ankle deep smoke. Never before has one machine offered this unique, affordable function. 10 kg of ice placed in the ice chamber can last up to 12 hours or 80 minutes with constant use. Full DMX on board means 100% control along with an output for separate units, and the timer remote puts that control in the palm of your hands. Drainage pump can be activated manually or set to automatic for optimum convenience.